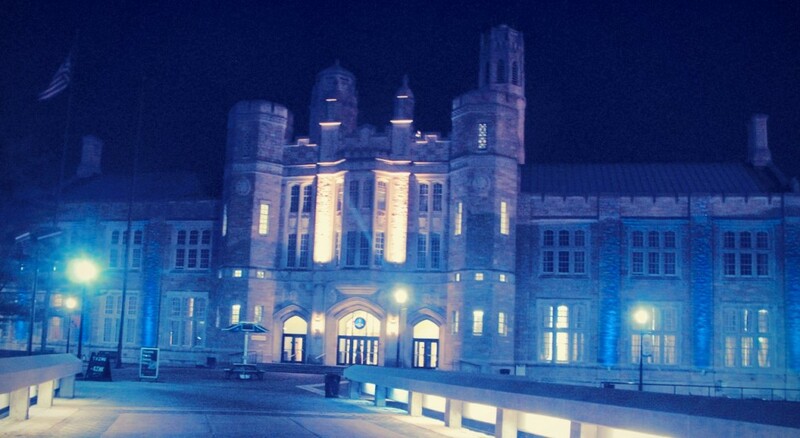 Lehman College celebrated World Autism Awareness Day on April 2 by lighting up the historic Music Building. “Light It Up Blue” is a global campaign to shine a light on autism. Lehman College joined iconic landmarks around the world, including New York City’s Empire State Building, in commemoration of the United Nations-sanctioned World Autism Awareness Day. Light It Up Blue kicks-off Autism Awareness Month and helps raise awareness about autism. World Autism Awareness Day, celebrated on April 2 annually, was adopted by the United Nations in 2007 to shine a bright light on autism as a growing global health crisis. Activities increase and develop world knowledge of the autism crisis and impart information regarding the importance of early diagnosis and early intervention. World Autism Awareness Day also celebrates the unique talents and skills of persons with autism and is a day when individuals with autism are warmly welcomed and embraced in community events around the globe. Autism is one of only three health issues to be recognized by the United Nations with its own day. Learn more about autism in this video edition of The Bronx Journal, a presentation of Lehman’s School of Arts and Humanities. Pamela Barahona speaks with ABA therapist George Rivera, who practices in the Bronx.